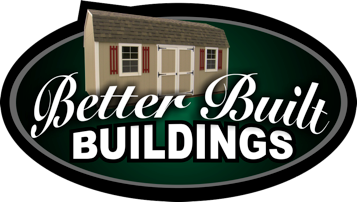 Pressure treated 4"x6" runners keep your portable building high and dry. •Quality framing lumber and #1 APA rated quality. •3/4” T&G plywood floors over joists 16" o.c. 30 year Architectural shingles -- nailed on, not stapled. High quality satin paint so your portable building looks good 10 years from now. Double doors are a full 62" wide with heavy duty 5" galvanized hinges. Wider doors available. Set and leveled on patio blocks, or we can provide an optional gravel pad.